After I experienced the wonder of Tet, Vietnam shifted gears. Once the Lunar New Year in Saigon ended, the city began its slow crawl out of a celebratory coma. Motorbikes that furiously ferried kumquat trees to houses around town started making the slow return to where they came. Trucks that carried knotted bonsai and crooked branches awash in yellow then picked up many of the trees, the flowers long gone, pointy branches sticking out of the back end of the vehicle as it bumped along the road. While a good part of the city does shut down during Tet, as a temporary resident it is one of the more pleasurable times of the year to be here. The frenzy of preparation and cleaning as the new year approaches is followed by a flurry of activity on Lunar New Year’s eve, and then a slow fall back into calm before the city recalibrates to its normal chaotic state. It isn’t just the heightened energy that is compelling, but also that drawn-out decline. In the narrow mini-alleyways leading off my street, doors remained open and families played board games or cards, half glancing up as passerbys approached. Kids stood in the middle of the lanes, giggling over a game of badminton or soccer. Groups of women crouched over bingo cards laid out on their living room floors, exposed to the world, a big change from the privacy so valued in the west. In those tiny interconnected passageways, no wider than my arm span — which, we all know, is not so wide — a whole other world exists. This is the same in many Southeast Asian countries — Thailand’s back alley sois also feel like they are a microcosm of humanity in one small space. But in the days after Lunar New Year in Saigon, you are exposed to all of the living at once, with lowered defences and many shouted invites to join in for a game, for a drink, for a bite of food. The spiderweb of tiny connected spaces are there throughout the year, and hellos or nods of greeting pepper any wander within them, but during a week of national celebration the enthusiasm and openness is potent. On the last day before the holidays ended and school began, the parks were teeming with people, and vendors flocked from all sides of the trees with no police to chase them away. ** A few days prior these parks were full of plants and trees and colour, a makeshift flower market for pre-Tet purchases. After the new year, the flowers were gone and for a few thousand Dong (15 cents), one can rent a space of cardboard to sit on and watch groups of students with guitars or playing cards, or just to eat tons of snacks and tea and soda, sitting and laughing as the sun sets on the new year vacation. **While street food is popular, vendors are often subject to a raid by the police. In the lead up to last year’s holiday, I was able to make banh Tet and banh chung, two forms of dense steamed rice cakes traditional to the lunar new year, with my landlady and her husband’s mother. 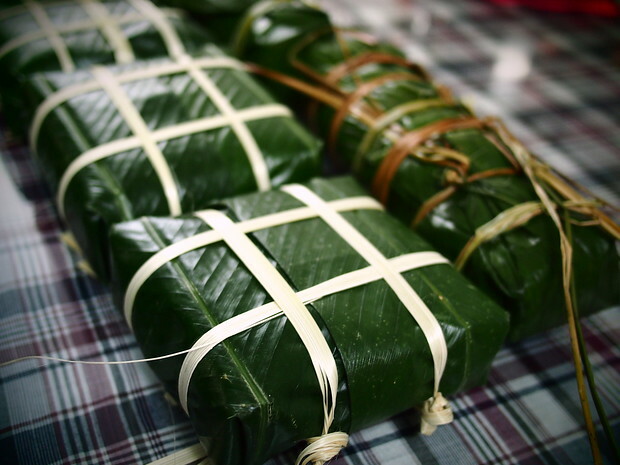 This year, I was invited by my friend Uyen to make them with her family, sitting on the floor in a pile of banana leaves and onions and pork and rice, trying to emulate the style of the steamed cakes without ruining them in my imprecision. 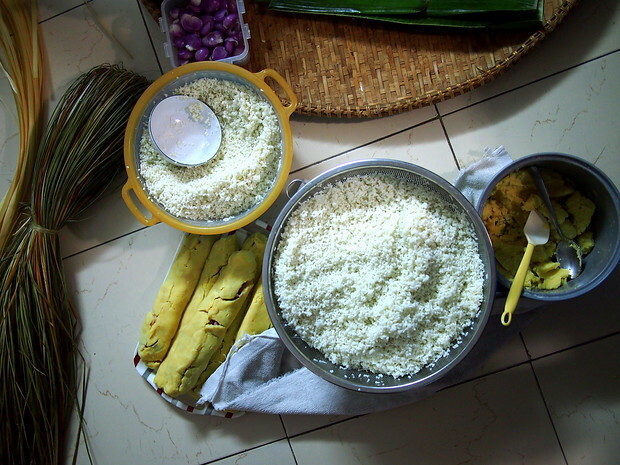 Banh chung, a square rice cake (seen in the bottom right of the photo below) is typically eaten in the north of Vietnam, and banh Tet, a round cylinder version of the same contents, are found in primarily in the south. 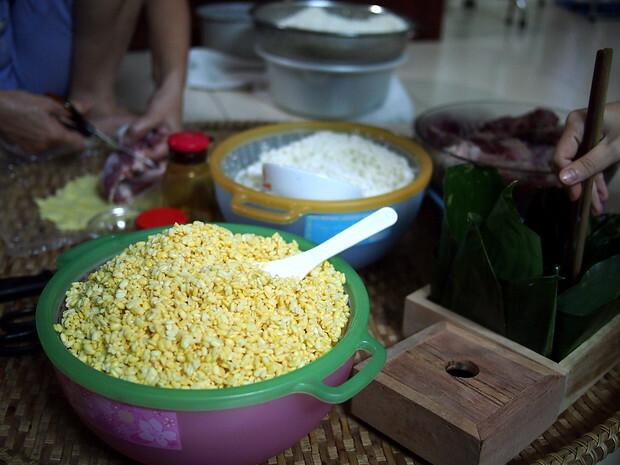 Beginning the preparations for banh tet (left) and banh chung (right). While versions of these cakes are eating throughout the year, demand skyrockets during Tet. Families often come together to make them, steaming the loaves for hours over a fire once the preparations are done. 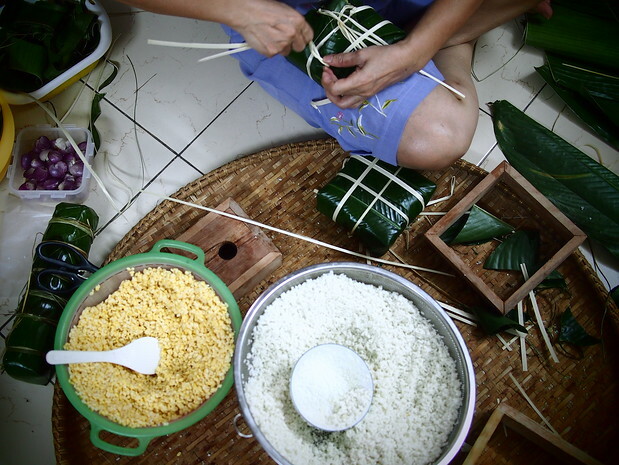 While meticulously folding lá dong (phrynium) leaves on her mother’s kitchen floor, Uyen recounted the story of the cakes, said to be part of a prince’s quest to be king. “…sat looking out over the rice fields all morning. At noon he had an idea. He walked back to his hut and soaked a pot of sweet rice after selecting the most perfect grains. He also soaked a pot of beans and then placed them on the fire to cook. He gathered fresh banana leaves in the forest. He planned to make some cakes that were square-shaped to represent Mother Earth and all the plants that flourished on her. He used sweet rice because it was the people’s most basic and essential food, enjoyed by even the poorest families in the kingdom. With his dishes symbolic of sky and of earth, of respect for his ancestors and an appreciation of what was within the kingdom’s borders, Lieu’s dish was selected by the king, and Lieu won his father’s heart (and the throne). Though not as extravagant as the other meals, the simplicity and ancestral worship dovetailed with the goals of the dynasty. I was given my own banh chung box to give the wrapping a try, putting my many years of present-wrapping in my family to the test. On the leaves, I layered rice, then beans, then pork and two small onions, and topped the pork with more mung beans and a final layer of rice. 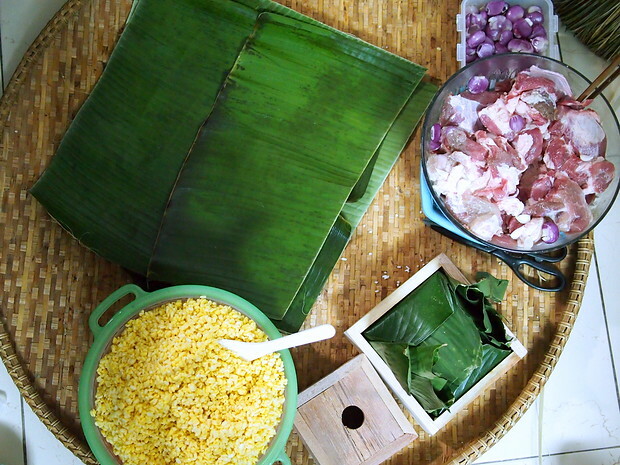 A square sheet of banana leaf, shiny side down, ensured that the rice took on a tinge of green as it boiled. With each layer, I was instructed to pack the rice and mung beans aggressively into the square mold, pressing hard against the corners. 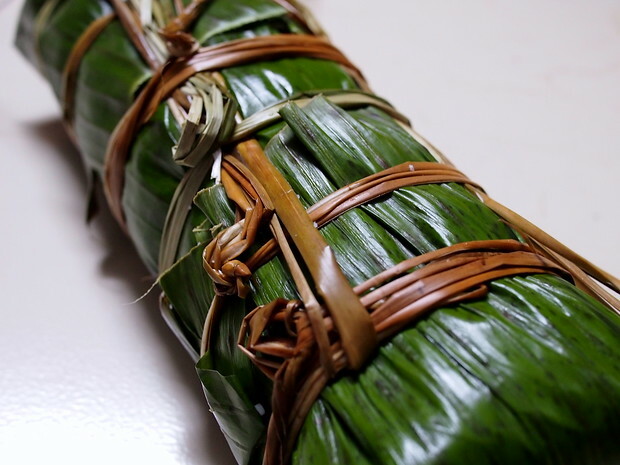 When the package was complete, I pulled the leaves as tightly as I could and flipped over the wooden square, pushing out the banh chung and tying with reeds. With the first package, Uyen’s mum shook her head. The wrapping, she said, was perfectly pulled against the ingredients inside — but the package was too anemic. I needed to add more rice and mung beans next time. The day at Uyen’s place was more than just a warm invitation to a long-standing new year tradition. As we worked on the rice cakes, she softly narrated her family’s history, how her parents met, and how she and her brother grew up. I left “banh school” a proud graduate of less skinny rice cakes, and the banh were put on the fire for the next many hours. Uyen dropped one off at my apartment the next morning, freshly cooked and waiting for lunar new year and my taste test. Our banh chung and banh tet lined up on the table. Banh tet, as wrapped expertly by Uyen’s mum. With two years of Tet under my belt, I can safely say that it is one of my favourite times to be in town. For visitors, I tend to recommend heading to the central region instead — to Hoi An or Hue or Da Lat — where travellers can relax by the beach and enjoy the colours and traditions. For those with more time, Saigon is an excellent place watch the rise and fall of energy as the lunar new year approaches and slips away. 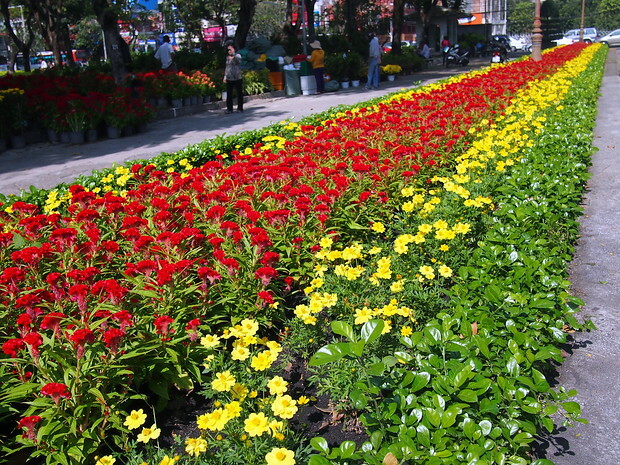 I get quite a few questions from readers about spending Lunar New Year in Saigon. “Is EVERYTHING closed? Did you stock up on ramen?” Yes, I did stock up but no I didn’t need it! The rumours of all restaurants closing are just not true; at no point did I have to eat my ramen as a result of Tet. While most of the street vendors are gone, visiting their own families, many of the tiny restaurants do open up quickly after the new year, and the backpacker area of Pham Ngu Lao is teeming with activity even on New Year’s eve. The downtown core near the river also shuts to traffic and sets up thousands of lights and lanterns and flowers; families take their motorbikes down and wander around with street snacks on hand, waiting for the midnight fireworks to begin. I meant to write this earlier as a “how to” for banh chung in time for the new year, but my post about getting dengue (and potentially chikungunya too) took precedence. Thank you also for the many well-wishes that have come my way. While I tended to pick a new place every winter during the last few years, I now relish the return to Saigon. If you’re wondering why, I wrote a loving ode to the city. It has come to feel like home in a very short time. Jodi. That’s a fantastic post with great pictures. 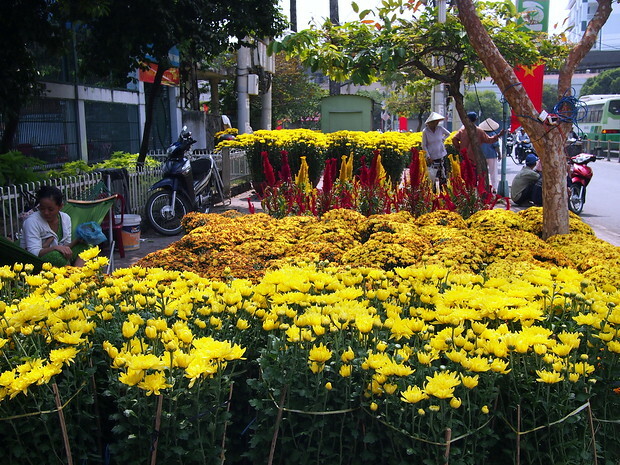 Tet is a wonderful time of the year to visit Vietnam. You made this lawyer jealous. While you were enjoying Tet. I was in mediations and depositions. Happy New Year. Good to know that the place doesn’t truly doesn’t shut down at Tet … I’d love to visit at that time! Saigon is one of Asia’s best kept culinary secrets. The fresh light flavours of the local cuisine are a perfect compliment to the warm climate. There are also plenty of restaurants serving up regional specialties from the the centre and the north. Hey! I love your blog – you’re an amazing writer! One question – how do you travel and stay in these SE Asian countries several months visa-wise? Thanks! Depends on your country of citizenship, Fabiola. Would check with your local embassy as each country’s visa rules differ depending on where you are from. Thanks Jodi for retelling the legends of TET cakes. You make me proud of being Vietnamese. I love your writings. You are a gifted and beautiful person . Hope our paths will cross one day. You think Tet was exciting now, you should have been there in “68”……NOW that was a Keeper !! Ah Dane of course I cannot even begin to imagine what it was like for you. I hope the way that I have written about the country as it is now has been sufficiently respectful to your history. Wishing you all the best.